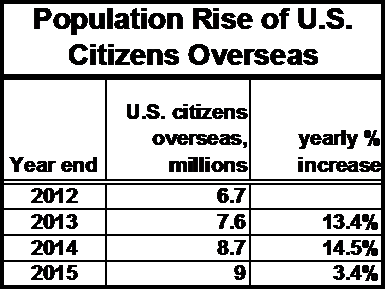 The population of the U.S. citizens overseas rose 34% in only 4 yrs, according to U.S. Dept. of State, whilst no U.S. candidates are addressing their issues and not even speaking to them. 9 million U.S. citizens overseas are PISSED OFF. In comparison, the average U.S. growth rate over 5 years has been only 4.1%. The fastest growing state in U.S., North Dakota, has risen only 12.5% in the last five years, to 602,000 residents. There are more U.S. citizens overseas than 40 of the U.S. states. Yet, not a single U.S. presidential candidate nor candidate for any of the federal offices has addressed the issues of U.S. citizens overseas or even spoken to them. Although figures are difficult to obtain, the highest increase in voter registrations is occurring overseas. You would think that candidates for federal offices would want to speak to their voters? How wrong you are–the candidates are back in the Homeland with their heads up their whazoo. So, where the heck are the U.S. candidates? Presidential? Senate? House of Reps? — Nowhere to be seen. We are being led by nobodies. The U.S. trade balance is the absolute lowest listed on its own website. Per capita, it lies midway between Iraq and Yemen. So what have the U.S. political candidates have to say about this? Absolutely nothing. Nada. Not a single remaining candidate has spoken to any of the 9 million U.S. citizens overseas. Republican Donald Trump has not uttered a peep, despite the active involvement and lobbying of Republicans Overseas and the expat/emigrant-friendly RNC platform. Democrats Abroad has involvement with its bureaucratic FATCA same-country exception platform and its support of Residence-Based Taxation (RBT), but (although it is part of the DNC) it has not penetrated the DNC platform. Bernie Sanders (after choking back his standard “offshore bank account rhetoric”) had told a D.A. audience that he supposedly supported Same Country Exception and RBT. Hillary did not attend the Democrats Abroad Global Town Hall, as she was busy at a fundraiser for herself in California. Her standin was Madeleine Albright, who attempted to placate the Democrats Abroad listeners with some semblance of herself as Hillary. Interesting that the Hillary-supporter online DA crowd was based in the recently-conquered, newly NATO-favorable Ukraine. Ukraine was a critical domino for the Hillary NATO conquest. Hillary plans to make FATCA more comfortable for its victims and to make Democrats more comfortable with dual taxation. The up-and-coming Gary Johnson is rising, despite being shut out of the polling mechanisms and the debates which are contingent upon polling results. He is expected to be on all of the ballots of all the U.S. states. However, Gary Johnson is yet to realize that Americans could actually live outside of America. The Green party is barely noticeable, but will soon also be on the ballots of all the states. However, the party and its presumed nominee Jill Stein have shown no interest to the U.S. expat population which numbers more than 40 of the U.S. states. The issues for U.S. expats are quite well summarized in their 2nd class status as colonial subjects. These U.S. colonists have listed up the Intolerable Acts which have been imparted upon them by their rulers in Washington. None of the new Washington rulers have given a squat about it. One would think also that the hundreds of U.S. Congress representatives and the current class of U.S. Senators might give a shirt. But they don’t. We haven’t seen a darmn shirt of them. Senators Paul and Lee have made noticeable efforts, but have not made much traction. Well, America, figure it out. You’ve got a current balance deficit that has been below zero since 1976. You deserve it. You should have figured it out that it is the result of extra-territorial taxation. Your exporters and your salesmen are sitting outside of your borders. If America treats their best allies (U.S. citizens overseas) like dirt, America will go down the hole. U.S. expats have been holding your export water for years, but all you do is piss on us. U.S. expats need to think like Al-Anon members. The U.S. will never get better until it completely crashes. So USA, either speak to us now or go crash. And don’t look for us until you’ve figured out what is wrong with yourself. Independence Day has brought upon new meanings to U.S. expats and U.S. emigrants. (Knowing that it was her that jammed the IGA’s down each country’s throat) Please do inform us if there is something that she offers that is of any use. « Was ex-CIA agent Philip Agee the target of the 1994 “technical amendment” barring U.S. citizens from leaving the U.S. on non-U.S. passports? 2. I wonder about the rise in the numbers of “Americans abroad”. 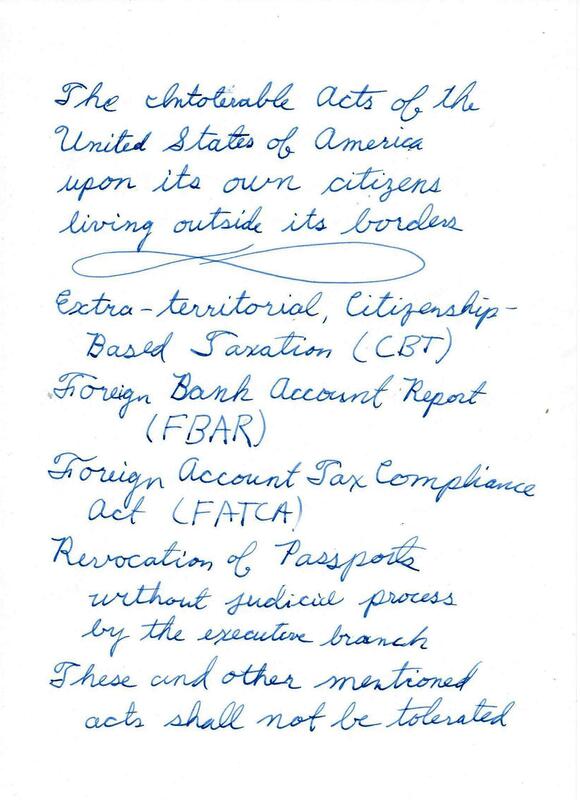 Is some of this attributable to the large number of people with “newly deemed U.S. citizenship” pursuant to FATCA and the awareness campaigns being run by the Condors and the banks? Some of the candidates spoke to the donors of the FATCA US lawsuit. I only listened to Ted Cruz. He was clueless about the issue but Americans living abroad fell over themselves to ask pretty much anything but reasonable questions about their plight. Nice reading treat for the holiday weekend. For me it’s Canada Day weekend (formerly known as Dominion Day) but we’re feeling less like a dominion these days and more like a US appendage. USCitizenAbroad has a good idea about approaching Gary Johnston. What’s not to love about a 9 million strong voter pool, full of many anti-establishment, FATCA/CBT fed-up, marginalized and neglected electorial treasures? I too wonder about the reason(s) for the increasing number (9 million now — WOW! ), considering the “Berlin Wall” around the USA is getting higher, stronger and longer all the time (for emigrants, not immigrants, that is). Maybe the fertility rate is higher among the expats? I’d hate to think it’s because of USCA’s point #2. Another imaginative post, Banc De L Asteroide. I too wonder where these reports of increasing numbers are coming from. Maybe it’s like the increase in the prevalence of some diseases when a there’s a breakthrough in the ability to diagnose it. FATCA is a breakthrough way of diagnosing US citizenship, I suppose. Thanks Banc de l’Asteroide for a timely post. It is now July 4 here in Sydney. While I don’t live in Sydney, I’m visiting to attend a conference, and the timing has me strolling down memory lane. 21 years ago today, I arrived in Sydney Airport, for the first time, two young kids in tow. My husband had arrived a few weeks earlier to find us a place to live and settle in at his new job. We arrived with a sense of excitement and adventure. It didn’t take us long to settle in on the NSW south coast – finding a Brownie group for the daughter, Scouts for the son; getting used to the similarities and differences of Australian English. While we have moved for jobs a couple of times (Melbourne and Brisbane), we have always felt at home in Australia. We became citizens as soon as we could. Meanwhile, with FATCA and other changes in the economic and political landscape of the US, America has never felt so foreign to me as it does now. Last month, three of us renounced our US citizenship (the son has moved back to the US and is looking forward to visits from his purely Australian family). So, this July 4 is truly Independence Day for me. I am finally free. Free from a compliance nightmare and form anxiety; free to save for my retirement just like my neighbours do; free to invest in managed investments and index funds. If the US doesn’t fix this mess by repealing FATCA and CBT, more of the diaspora will be leaving, either formally as I have done, or informally. @USCitizenAbroad: the info about Gary Johnson is very interesting and (were he to focus on FATCA/CBT issues) nine million sympathetic voters abroad could only help his cause. However, from my brief reading of the article, in order to qualify as an independent he needs to gain 15% support in the polls. Do you know if there is any way US citizens abroad can influence the polls or would their vote only have impact if he were to qualify? 1. Every state has its own rules for determining who is on the ballot as a candidate for President. 2. I read in one of the two articles I cited (I think) that he has already qualified to be on the ballot in every state (if so this is an UNBELIEVABLE achievement). 3. He must on the ballot to be able to vote for him (unless a “write in” is possible). I believe that we could deliver this guy 5 million votes. Not all those votes would be from Americans abroad. Some would vote for him because they would see FATCA and CBT as extremely unfair once educated on it. Trust me … It is possible to educate an homelander. I did it last week. But, the real value is that we would give him a reason to get this issue into the public discussion (as part of tax reform). I STRONGLY SUGGEST that somebody (perhaps from the Isaac Brock Society or one of the larger Facebook groups or both) should reach out as soon as possible. This is “win win” situation. Also as a Libertarian, he is likely to not be happy about FATCA and its ilk anyway. Now that you have renounced, you are living the American dream! Hope you don’t mind but I thought your comment deserved a post of its own. @Rise and Fall: Johnson is on the ballot in 50 states. The 15% poll number is necessary to be included in the presidential debates. But in my 3+ decades outside the Homeland I have not once been polled about my preferences for president. We so-called 9 million absolutely do not count. Gary Johnson isn’t an independent; he’s the candidate of the US’s Libertarian Party. Not only does the Libertarian Party appear on general ballots; the Libertarian Party has primaries just like other US parties. When I was a US citizen, I usually voted for Libertarian candidates for US national offices. Even though Canada’s Libertarian Party has a lot in common with the US’s Libertarian Party, I have a hunch that they didn’t forward a message about FATCA. I agree that Russell`s post is an absolute eyeopener! It is like if there was a war- this is news directly from the front lines. These are the absolutely devastating effects of policy that those in government are refusing to acknowledge. While committing a tax grab for a quick dime – these are the long terms effects which will wreck havoc on the US economy. Also shocking to me is that the US trade balance is compared to that of Yemen or Iraq. All we keep hearing is stuff about the recovery. It gets very confusing. No, it’s while committing a penalty grab for US$10,000 per violation, where rules shift as necessary to make every possible answer a violation. That’s why they need the additional US$2,350 per renunciant. @Polly, let me just add to @Russell also with a thank you to him. Some of the moderators are aware of my skill sets and my former life. I have been repeatedly turned down for high profile positions in particular with start up firms because of my former Americaness. At first I thought it was a matter of simply being partly documented with “only” a US Passport cancelled by State with INA Section stated in the red stamped box and an additional letter from the USG. Upon further asking if a CLN would assuage any fears….the response was always NO. I would not make a blanket statement that all current/former Americans are persona non grata in the startup business world BUT I can say that many start ups have heard enough to stay clear of yankees. The main thrust of our discussion involved ways people can protect themselves from laws and regulations being passed throughout the West that are stripping savers and investors of their financial privacy. Once financial privacy is removed, it is easy for government to confiscate funds on a massive scale. It’s happened over and over throughout history. Paul believes, as I do, that it’s going to happen again in the West, and relatively soon. Paul used to work for mainstream financial shops but became increasingly upset with the lies and corruption. Eventually, he decided to quit and recently renounced his American citizenship entirely. He is urging clients to get themselves and their funds offshore while they still can. That’s a great idea. With the advent of the Panama Papers hack supposedly showing that important individuals were placing their funds offshore to avoid taxes, new regulations have been passed to compel the public presentation of corporate structures. Around the world, financial privacy is basically… finito. Additional laws and regulations are often aimed at banks, and with the same intentions. The idea is to compel banks around the world to strip away customer privacy by demanding an enormous amount of information before an account can be opened or a transaction can take place. The most notable example of this is FATCA, which compels banks to closely track their American customers financial dealings and extract taxes from American accounts to send to the IRS. Many banks around the world won’t do business with Americans as a result. US citizens are having more and more trouble setting up private and corporate accounts and keeping them active. Wow. Could we get her to elaborate? 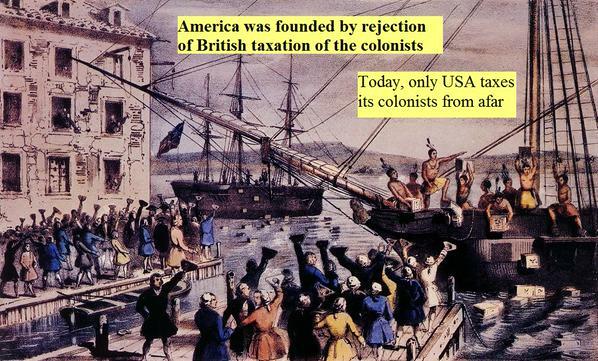 Way back in 1776, thirteen British colonies were so sick and tired of something called citizenship based taxation, that they told their masters where to shove it. This act became known as the Declaration of Independence. Today millions of Americans living abroad, face far more brutal oppression, and some of us have gone so far as to make our own Declarations of Independence telling our Congressional masters exactly where to shove their Citizenship Based Taxation. Celebrating an Independent Fourth of July. These libertarian wing nuts will strip you of your money more quickly than the IRS. Hillary’s main concern is that some Americans abroad have trouble accessing a bank account . She is unconcerned about duals and accidentals. She’s only concerned with “law-abiding” (compliant) Americans. In other words, the ones most likely to vote. …which is why one needs to look at all sides. http://news.nationalpost.com/news/canada/freedom-and-liberty-not-enough-to-save-galts-gulch-chile-libertarian-community-from-bureaucracy-and-internal-dissent. The FATCA discussion in this is relevant and worth a listen for anyone looking at all possible aspects of what it MAY mean down the road, without going into the rest. Unlike other assets like gold, houses have a real value. They offer protection from the weather. They offer comfort and prestige. How will FATCA be used? What is its purpose, just a vindictive punishment for those who have left the homeland and their children, many born abroad OR children born to other-country parents in the US OR born in a hospital in the US as that was the closest hospital when mom was ready to give birth — OR is there a bigger purpose to taxation-based US citizenship? Sorry, Mrs. C; too little, too late. Call me cynical, but your comments sound to me to to be nothing more than a crass vote-buying exercise. Things have gotten continually worse since Obama became President and you were totally missing in action on this file when you were a high official of that government. Suddenly you now care about expats? Give me a break. I couldn’t care less whether or not you become the next President. I can’t vote for you or anyone else because I got rid of that toxic US citizenship years ago just to escape from assholes like you and the system you created. Russell had it right way up thread; “Truly, a nation of idiots.” Go pound sand. The 4th of July means nothing to me, neither does a US election other than what effect a new US president may have on Canada where I live. I could not care less about FATCA or what problems the US has with funding its crippling industrial military complex and extraterritorial wars. I could not care less that my birth certificate has a US state on it, other than for the discrimination I suffer because of it. As far as I’m concerned I’m a Canadian, not a US tax slave. All I want is to be left alone and to have nothing more to do with the place where I was born and left decades ago. Justin Trudeau says he wants to promote gender neutral identification as a means to reduce discrimination against people who fall into non conforming gender roles, I applaud that effort, however it does nothing for people who are discriminated against due to their place of birth, so I’d like to see Trudeau promote identification that are “place of birth” neural and make it very clear that discrimination based on place of birth has no place in Canada. I’d like Canada to assign me a new official birth certificate that allows me to select a place of birth other than the USA so that I can safely travel abroad without the fear of discrimination for being born in a location other than Canada. We do not have to indicate a place of birth on a Canadian passport, however an absent place of birth is a red flag that will subject you to discrimination and even possible harm when traveling to some countries, however if Canada allowed its citizens to change their official place of birth, then that would greatly protect individuals who are left vulnerable to discriminatory acts of harm simply because of where they were born.